When I first met Ian, it was at a post-match social for Mystic River inside a private Malden, Massachusetts bar. When you walked inside the place, the first thing you saw was a few tables of guys who wouldn't look out of place in the next Casey Affleck movie (locals, townies, you know the type. I think one of them was actually smoking a cigarette, I don't know, I just kept on moving). So, you can imagine the contrast provided by the few back tables, which mostly consisted of young, in-shape rugby players, one of whom had an Australian accent. Naturally, I chose to talk to him (Note: having now worked in the same office as Sam Windsor and Matt Trouville for two months, my infatuation with the dialect has waned considerably). What I gathered from our conversations, including with others amongst the Mystic River Boys, was that Ian was a genuinely thoughtful guy who had both a passion and wealth of knowledge when it came to rugby. I had a strong feeling after meeting him that he might posses the acumen needed for MLR. So, when I had heard that he had in fact taken the next step, I was not only excited for him, but I was hungry to get the first major interview of an ascending Aussie with roots (transferred though they may be) in Easter Massachusetts. So here it is, and-oh, You KNOW I had to ask if he were a wizard or a Jedi. That part's included, don't you worry. 1. What do you find to be the biggest difference between American Rugby culture and Australian? The way we train. In Australia, coaching was generally focused on the basic skills and developing that natural rugby instinct. In America, we train a lot of big picture/full team drills. This is helpful for getting players with different rugby experiences clicking on game day. Off the field, there isn’t too much difference between cultures. Post match socials are a part of the game that shouldn’t change wherever you play. 2. Why do you think the United States has chosen to embrace Union as opposed to League? Union as a sport is more global than league. What surprised me when I moved here was the number of colleges that had club rugby teams. Not all were very good, but so many schools had a team. I think exposure to the game at that level and even younger around high school is important to growing the player and fan base. I do think that there will be a market for rugby league in the USA eventually. 3. New England College is known to have a great rugby program (my school even forfeited a game against you because we didn't want to get crushed that bad). What was your favorite part about playing for that program? I had a lot of good memories from NEC both on and off the field. Winning a couple of NSCRO national championships has to be up there. 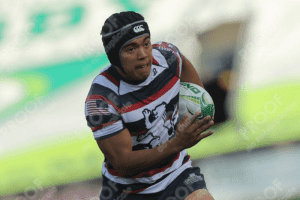 My senior year we moved from NSCRO to D1. Those in the rugby circle shouldn’t ignore NSCRO because it really is a good platform for competition, but to play against the bigger college rugby teams and hold our own was great. It was something that we as players wanted and I thought we stepped up to the task with some unexpected wins. 4. You've spent time with Mystic River, who have fed heavily into the upcoming FreeJacks organization. What do you think of Josh Smith as a coach, and the organization as a whole moving forward? Do you think Boston will embrace rugby? I played with Mystic for a couple of years after I graduated from NEC under Josh. I’ve got nothing but great things to say about Smitty. I think everyone has had that coach that you just want to play for and Smitty is one of those guys. The FreeJacks are in good hands. The interesting part will be to see how the club scene fits in around MLR over the next few years. Wherever club rugby in New England goes I’ve got no doubt Mystic River will be leading the way as they have for a while. The FreeJacks are the biggest thing to happen for rugby in New England and I’m confident fans will get behind it. There’s already a great rugby community to support right away and others will catch on. 5. Now that you've made the move to Utah, what excites you the most about playing under Alf Daniels and his system? Do you think it will benefit your skill set? It’s early days for me in Utah, but there’s plenty to be excited about. Alf and our assistant coaches, James and Stevie, have worked hard to really bring this team together with a system on both sides of the ball. They want us to attack with flare like last season, but also bring in the structure and the defensive grit needed for a championship team. If we put that together, the results are going to come. From a halfback perspective, I think our style of play will be good for me. We’ve got guys that are strong in contact and will definitely get over gain line. Fast ball for me at the breakdown will mean plenty of opportunity for the outside backs to do work. 6. Who are some of your teammates that you think are flying under the radar but could make a big impact? I think our team as a whole are flying under the radar. We’ve been quiet on social media compared to other teams, but we’ve been working hard behind the scenes. Calvin Whiting is a BYU player that’s with us this season. He’s had opportunities with USA and I think he’ll be a good asset for us in the midfield this year. Franco van den Berg is a Springbok U20s Loose-head that lives for rugby. Whether it’s a scrum, tackle or breakdown, he hits everything at 110%. 7. Utah fans were some of the best in terms of turning out for games. What's been your early impression of Warrior Nation? They’ve been great. My first real chance to mingle with our fans was after the Life West scrimmage. With little notice and limited room, we fit about 1000 fans into the indoor field where the scrimmage was held. If that’s anything to go off of, Zions Bank Stadium is going to be lit when Glendale comes on February 23. 8. If you had to choose one uncapped player to get a shot at team USA, who would it be? 9. Who's a veteran presence on the Utah roster that provides the beat element of leadership? John Cullen. He had a tough year with injury last season, but he’s all in this year and leading from the front. 10. Would you rather be a Jedi or a wizard? Wizard. I think I would have made for a good Quidditch player too.